Robert Luff & Co are delighted to offer to market this beautifully presented and character filled Grade II listed Georgian house ideally situated within the popular Amelia Park development just yards from town centre shops with restaurants, the beach, parks, bus routes and Worthing's mainline station all nearby. Versatile accommodation set over four floors consists of entrance hall, living room, formal dining room, kitchen / breakfast room, utility room and downstairs w/c. Upstairs on the first floor is three double bedrooms and a family bathroom. 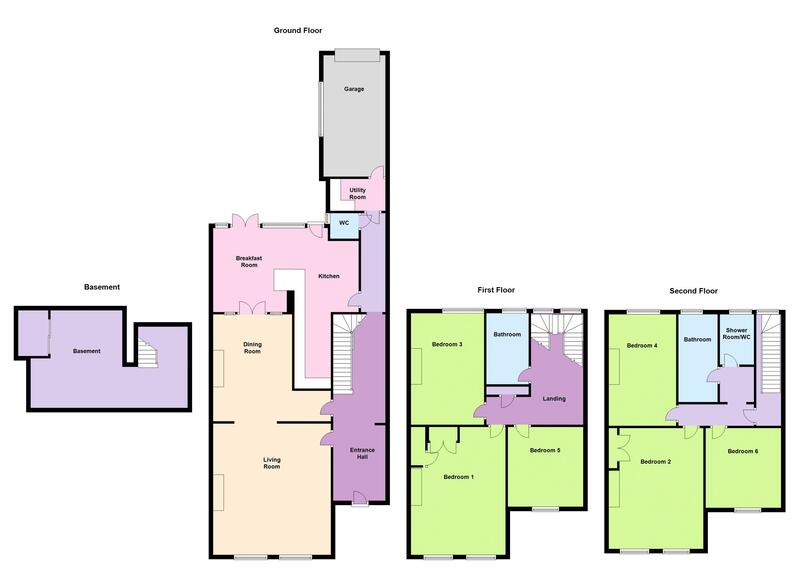 On the second floor there is three further double bedrooms, family bathroom and family shower room. The property also benefits from a large basement, garage and a good sized enclosed rear garden. Original coved and textured ceiling, ceiling rose, three radiators, stairs leading up to the first floor, further stair case leading to the basement. Feature coving, ceiling rose, wood stripped flooring, two radiators, feature open fireplace with marble effect surround and hearth, picture rails, wall lights, two south facing sash windows overlooking the beautifully maintained Park Crescent communal gardens. Plastered ceiling housing recessed spot lights, matching range of wall and base units, roll edge work surface, one and a half bowl sink unit with single drainer, built in Bosch dishwasher, space for range style gas cooker, overhead extractor hood, space for American fridge/freezer, part tiled walls, two double radiators, part wood panelled walls, double glazed windows and doors leading to private and secluded rear garden. Plastered ceiling, storage cupboards and window. Plastered ceiling, radiator, low level WC, hand wash basin and tiled splash back, frosted window. Plastered ceiling, base level storage units incorporating roll edge work surface, butler sink, space and plumbing for washing machine, part tiled walls, extractor fan and door leading to garage. Plastered ceiling, radiator, built in airing cupboard housing hot water tank and shelving, two windows on half landing providing natural daylight, stairs to second floor landing. Plastered ceiling, picture rail, two radiators, feature fireplace, built in part mirror fronted period wardrobes, two sash windows with views over the beautifully maintained Park Crescent communal gardens. (Currently being used as first floor reception room). Textured ceiling, picture rails, double radiator, feature sash window. Coved and textured ceiling, TV, telephone and internet connection points, part wood stripped flooring, radiator, door leading to balcony and views over Park Crescent communal gardens. Coved and plastered ceiling spot lights, panel enclosed bath with wall mounted power shower over, bi-folding shower screen, low level WC, hand wash basin with vanity unit below, part tiled walls, heated towel rail, sash window. Plastered ceiling, loft hatch, large window to rear on the split level landing. Plastered ceiling, double radiator, built in wardrobe, two sash windows. Textured ceiling, double radiator, sash window. Plastered ceiling, panel enclosed bath with hand held shower over, shower curtain, low level WC, hand wash basin with vanity unit below, double radiator, part tiled walls, cupboard housing Worcester combination boiler, sash window with views towards The Downs. Plastered ceiling housing spot lights, double width shower cubicle with wall mounted power shower, low level WC, pedestal hand wash basin, part tiled walls, radiator, sash window with views towards The Downs. Mainly laid to patio with various raised shrub and flower borders, pond, barbeque area, outdoor lighting, side gate leading to front of garage area, up and over door providing rear access to property, outside tap. Accessed from Amelia Crescent, up and over door with power and light, window to side, door leading to house. Wood panelled walls, wall mounted gas fired boiler system. Providing excellent storage space and huge amounts of potential.